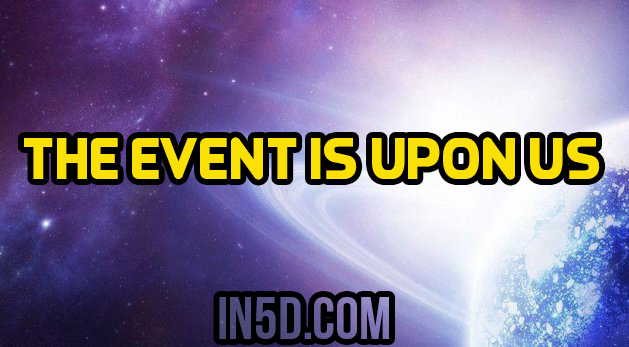 The event is upon us By research, visions and channelings. I have narrowed it down to the 3rd week in March. I can’t know the exact time and date because there were oaths taken by those I communicate with. It was just revealed to me who I have been communicating with throughout my journey this week. I haven’t been allowed to put all the pieces together until now. There are around 7 billion people on this planet about 1/3 will disappear. They will be going to the new earth or the transitioning place. Yes the new earth is a separate place than this earth. Who stays and who goes is decided on the condition of their soul. Since none of us truly knows what is in another’s soul. There is no way to know who is going and who is not. There is a transitioning place in between this earth and the new earth. I have been there about 3 years ago. I didn’t know at the time it came clear to me now where I was. I had a dream 3 years ago. They aren’t really like the traditional dreams we are used to but I don’t know what else to call it. I am asleep when it happens and wake up covered in sweat. I woke up in a place full of people. The place was not on earth. It looked bare like an inside of a military plane.There were bars with stools and people were sitting around the bar. These people looked like they had been through hell. Like they had been through a natural disaster. They had small bags that looked like they were packed in a hurry. People were confused and didn’t know what happened to them or where they were. There was a little girl of about 6 years old. She was in a dress and running around looking for her parents. I tried to catch her to comfort her but I couldn’t. I then saw someone with a clipboard. I walked up to them. I could not tell the gender. They were dressed in a uniform but in place of their face was a bright blinding light. I then asked why I was here. They asked my name. I told them and they looked me up on the clipboard. They then said “Don’t worry you are a comrade. You will be given a private room.” I then woke up in a pool of sweat. I now know this is the transitioning place between the old earth and new earth. That some people will go to after the event. Some stay on earth, some go to the new earth and some go to the transitioning place. I do suspect people have been going to the transitional place for awhile now. Most likely overdoses. Just because someone is in addition doesn’t mean they are a bad person. It is their soul that matters. The weakest have been being weeded out for awhile now. Those that could have not survived the event have been taken earlier. The old earth will be left a mess. With a third of the people just gone there will be chaos. Those that didn’t pass the test. That chose not to change or raise their vibration will stay. Resources will dwindle and many people will have to come together to survive. Basic human necessities will be hard to come by. There will be much misery and suffering. The transitioning place will be for those who were good people in life but sadly fell into addiction and separated from their spiritual selves. Those that have focused their resources, time and energy to an addiction they had to feed. An addiction symbolizes doing something that goes against one’s spiritual beliefs and doing something that goes against your greater good. We have already received the mark on our foreheads a long time ago, it has just not been visible. This mark seals us that we can’t be harmed or touched. This mark is a crucifix where our third eyes are located. Others will be able to see it now after the event. We will never go without what we need. Our gifts and abilities will be upgraded and intensified. When we need something we will be able to instantly manifest it. Our knowledge and healings we do will be greatly needed here. We will no longer be kept hidden and isolated. It is time for another phase of our missions to start. We have been kept this way so we were safe and not too attached to anyone that it would cause us pain. Our families will be able to watch us from the new earth. They will know who we are now. Everyone will know who we are now. We will finally meet each other. We have been placed in strategic locations on earth. We will get new locations after the transitioning time is over. We are left behind to help save people and the old earth. So that they can transition to the new earth or the old and new earth will merge. What happens depends on how this phase of the mission goes. This is all the information I have now that I can reveal. I am getting information almost constantly now. It is so much that I have to process it before passing it on. It has also been given to me over years. So new information and old information has to be combined. I will keep you up date as much as I can. About the author: I am a magnetic energy worker, lightworker. My journey has taught me that there are many different energies available for lightworkers to work with on the Tree of Life. I have recently been guided to work with animals. I do energy work on animals especially abused ones. Which also leads to energy work on their owners. My mission is to help all life on beautiful Gaia. You can find me on Facebook or my blog soulsisterstruth.wordpress.com. You can email me too at dawnbailey7771@gmail.com.